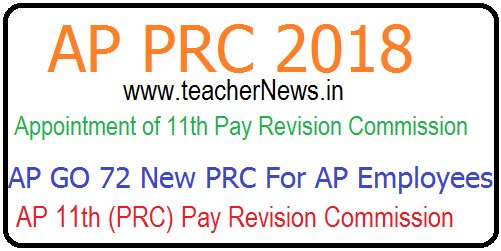 AP Government Appointment 11th Pay Revision Commission (PRC) for AP Employees and AP Teachers. AP PRC 2018 Appointment of 11th Pay Revision Commission: The Pay Scales of the State Government employees were revised with effect from 01.07.2013 with monetary benefit from 02.06.2014. APJAC of Employees, Teachers, Workers and retired employees Associations (AP JAC Amaravati) have represented for constitution of another Pay Revision Commission for the State Government employees. Government has considered the representations and after careful consideration, has decided to constitute the 11th Pay Revision Commission for the State Government employees. 2. From the Finance (PC.I) Department e-file bearing No.FIN- 33024/29/2017-SO (HR IV)-FINANCE, dated:09.05.2018. (i) To evolve the principles which may govern the structure of emoluments and the conditions of service of various categories of employees of the State Government, Local Bodies and Aided Institutions, Non-teaching staff of the Universities including Acharya N.G.Ranga Agricultural University, Jawaharlal Nehru Technological University, Work charged employees and full-time contingent employees, which have a financial bearing taking into account the total packet of benefits available to them and suggest changes therein which may be desirable and feasible; The Commission however shall, not deal with the teaching staff in Government Colleges and Government Aided Private Colleges drawing UGC/AICTE and ICAR scales. The Commission shall also not deal with the officers of A.P. State Higher Judicial Service and A.P. State Judicial Service who are drawing Pay Scales as recommended by the First National Judicial Pay Commission. (vi) Review of the existing human resources of all departments in tune the contemporary requirements including contract/outsourcing personnel particularly in the context of State bifurcation. AP PRC 2018 - Appointment of 11th Pay Revision Commission - AP 11th (PRC) Pay Revision Commission Appointed GO 72 For AP Employees and Teachers.